We've been writing and raising awareness about environment issues this month such as deforestation and food waste, however as today is Earth Day, I want to celebrate the amazing things that Mother Nature has created. Below are 12 incredible places around the world, created by nature. Bioluminescent plankton is not only found on the Southern Thai islands, but it is one of the most popular places to experience this wonder. The glow is the product of marine microbes called phytoplankton and the brilliant light can be found in oceans all over the world. This salt flat in Bolivia, also known as 'Salar de Uyuni' is the legacy left over from a prehistoric lake which went dry, leaving behind 11,000 square kilometres of bright white salt. This has created a dream-like landscape where sky and land seem to merge. The lithium in the area actually makes up half the world's supply, and is used in batteries for phones and computers. Known as 'the Wave' for obvious reasons, the area features spectacular yellows, pinks, and reds in the twisted sandstone. The unique blends of colour are partly caused by iron deposits. This stunning sunken forest was created in 1911 as a result of a 7.7 magnitude earthquake. The quake triggered a huge limestone landslide which formed a dam, and over time water flowed into the area covering the trees. Due to the limestone deposits in the area, Lake Kaindy has an almost unnatural blueish-green water which is different from other lakes. Puzzlewood is a thoroughly enchanting forest located in the beautiful Forest of Dean, Gloucestershire. The magical scenery of Puzzlewood has made it popular for filming, and it is even said that JRR Tolkien took inspiration for the forests of Middle Earth. The spectacular peaks in the Tianzi Mountain Nature Reserve were formed 400 million years ago. Once sedimentary rocks, growing under an ancient ocean, they because quartz sandstone over millions of years. The mountain provides stunning views of peaks, which rise amongst the fairytale landscape, one after another. Gullfoss Waterfall truly is a force of nature, and I'm lucky enough to have seen this one with my own eyes. Nothing quite compares to the roaring power of the water as it rips down the rugged canyon. It was designated as nature reserve in 1979 to permanently protect the waterfall, and allow visitors to enjoy the the area. 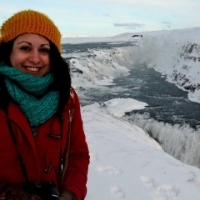 Jenny of Arya Candles at Gullfoss Falls, wishing she was wearing at least 3 more coats. A cenote is a natural pit which has resulted from the collapse of limestone bedrock which then exposes groundwater underneath. This creates a magical pool of crystal water and Ik Kil is particularly spectacular. The waters of Ik Kil were considered sacred by the Mayans, who used the area for human sacrifices to their rain god. Bones and jewelry were found in the deep waters by archaeologists. For a short time every year, during the rainy season of Japan, these otherworldy glowing mushrooms sprout from rotting wood. These mushrooms contain an enzyme, luciferese. When this enzyme is oxidized it emits energy in the form of light. Literally translated to 'Cotton Castle', Pamukkale is an unreal village which has these spectacular water terraces. The terraces are made of travertine, which is a form of limestone. There are 17 natural hot springs laden with minerals with dramatic scenery, so it's no wonder people have been visited them for thousands of years. The area of Pammukkale is also the site of the ruins of Greek-Roman city of Hierapolis. There are few places that you can experience every stage of the water cycle at once, and Mendenhall Ice Caves are one of them. The glacier is 12 miles long and is only accessible to those willing to kayak, and then ice climb 8 miles over the glacier. These caves exist because of the melting glacier, however it is retreating increasingly fast as global warming causes temperature rises. But who knows what will come next? I'm a firm believer that everyone should travel, see as much as possible, and make memories all over the world. I hope that these 12 incredible places have inspired you to plan a trip somewhere. The world is full of truly incredible, breathtaking places, so please share with us in the comments below somewhere you've been or aspire to visit one day. To learn more about our Earth Day campaign, and to see our limited edition Earth inspired candle, please click here.